It was my favorite painting at Mia when I was a kid: The Birthday Party, by the American artist John Singer Sargent. I looked for it whenever I visited the museum with my parents or on a field trip. The subject would captivate any child, but for me the image encapsulated what it would be like to grow up in a fancy house in Paris “in the olden days.” Sure, the father seemed aloof, but the mother’s warm presence and pretty taffeta dress more than made up for that. I adored the beautiful red dining room, and there seemed to be room for me at the table. Sargent put the tabletop in the foreground, making it look as if one could pull up a chair and join the party. There was even a spare water glass and china teacup—undoubtedly remnants of Sargent’s own place setting. Now that I’m a parent who has thrown and attended many children’s birthday parties, the scene strikes me as enviably elegant for such an occasion. In the darkness of night—surely past this child’s bedtime—Sargent gives us a celebration both intimate and stylish. The table is illuminated by a Japanese-inspired chandelier and dancing candles, with light shimmering against the white tablecloth, porcelain, silver, and glassware. The family were friends of Sargent: Albert Besnard, a painter, muralist, and printmaker; his wife, Charlotte Dubray Besnard, a sculptor; and their eldest son, Robert. Sargent, who grew up in Europe and traveled constantly, was working in London when he met the couple. Charlotte had moved there with her parents in 1875 (her father was also a sculptor) and led an active career producing portrait busts of English society. Albert, fresh from winning the French Academy’s prestigious Prix de Rome, joined Charlotte in London after they married. They stayed for three years, returning to Paris in 1883 when Robert was 2 years old. Sargent, in fact, moved into Albert’s London studio when the Besnards moved to Paris. 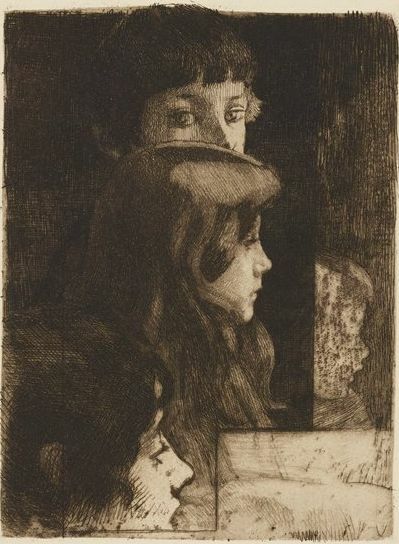 I was recently combing through Mia’s collection of prints by Albert Besnard when I discovered a surprising number representing family members, particularly Robert. Most came to the museum from the bequest of Mrs. Charles S. Pillbury, that is, Nelle Pendleton Winston Pillsbury. The Pillsburys lived across the park from the museum in the mansion now home to the nonprofit Blind, Inc. The prints were given in 1958, four years before Mia acquired Sargent’s painting. This past November, the museum purchased another Besnard print, a portrait of Charlotte that incidentally shows her in a pose nearly identical to Sargent’s. These prints are being gathered for the first time in a new exhibition of works on paper, “Childhood in Paris: The Birthday Boy and Friends,” in Gallery 353, a stone’s throw from Sargent’s painting. 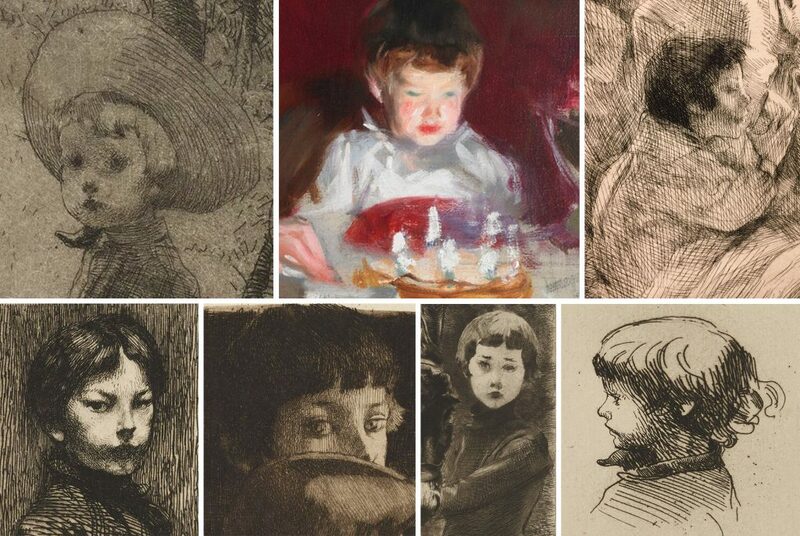 We can not only watch young Robert grow up before our eyes, but also, by comparing Mia’s six etchings of him to his face in Sargent’s painting, judge whether we have been mistaken about which birthday Robert is really celebrating. Robert Besnard, growing up in his father’s artworks. Clockwise, from age 3 at upper left to age 9 and a half at lower left. 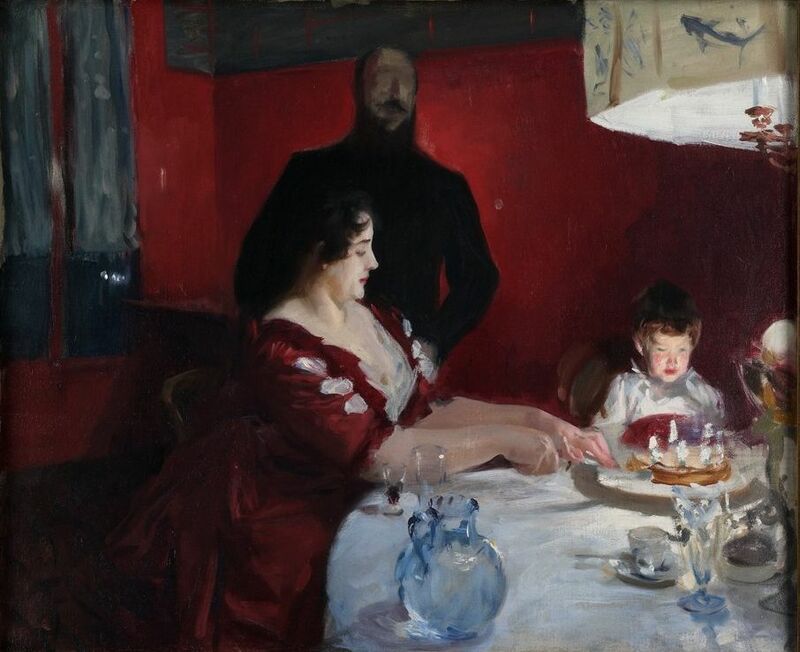 Sargent’s painting has traditionally been dated to 1887 based on the number of candles on the cake, usually counted as six (Robert was born in 1881). Yet if we trust Albert Besnard’s comment that Sargent painted it in 1885, just after the family had settled into their house on rue Guillaume-Tel in Paris, the boy in the painting would be turning 4. To my eye, this seems more realistic. The prints dated before 1886 show the same childish jowls, undefined brow, and docile stare depicted by Sargent. A date of 1885 for Sargent’s painting would also explain the absence of Robert’s siblings, who appear in Besnard’s later work, A Family, from 1890. Robert’s sister, Germaine (1884–1975), would have been an infant in 1885 and perhaps asleep before the evening festivities began. In 1887, however, at age 3, she would surely have been a big presence. Baby Jean (1889–1958) came along later, but brother Philippe (1885–1971) is also missing from the birthday party. Charlotte would have been four-months’ pregnant with Philippe in June of 1885 when Robert turned 4. This could account for Sargent placing her warm and plump maternal presence at the very center of his work. 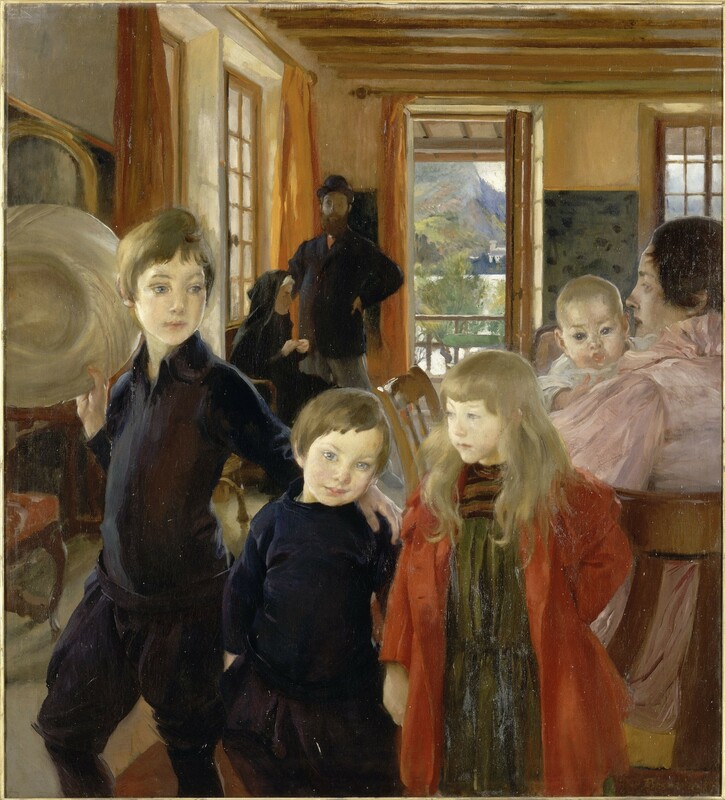 Sargent’s tight cropping could have excluded some of the party guests, but the calm, focused mood suggests instead that the younger siblings were not on the scene. Having recently hosted a DJ’ed dance and pizza party for my daughter’s 9th birthday, I can also say with conviction that the elegant party depicted by Sargent is the kind of grown-up affair reserved for a first or only child. Even accounting for the sophisticated climate of fin-de-siècle Paris and the help of household staff, which we know the Besnards had, birthday parties shift gears when adults are outnumbered. And while Sargent, a lifelong bachelor and cosmopolitan dandy, might have been happy to oblige his friend by attending his son’s birthday dinner in 1885, the invitation two years and two children later would likely have held less appeal. How many candles? Sargent’s loose brushstrokes could suggest six, seven, or even eight. So what about the six candles? They are, at best, an unreliable marker. 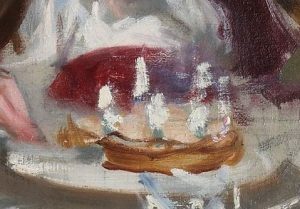 More likely, Sargent lined the perimeter of the cake with these luminous blobs of white pigment for aesthetic effect. Indeed, his loose brushstrokes could suggest seven or even eight candles. It is also possible that the Besnards added candles to their child’s cake, as was customary, to represent years to come. Or Sargent may have invented the whole scene, though Albert reported that Sargent painted the work in Paris and presented it in exchange for a work that Albert had given him. Sargent was visiting Paris at the time of Robert’s June 1 birthday, both in 1885 and 1887. 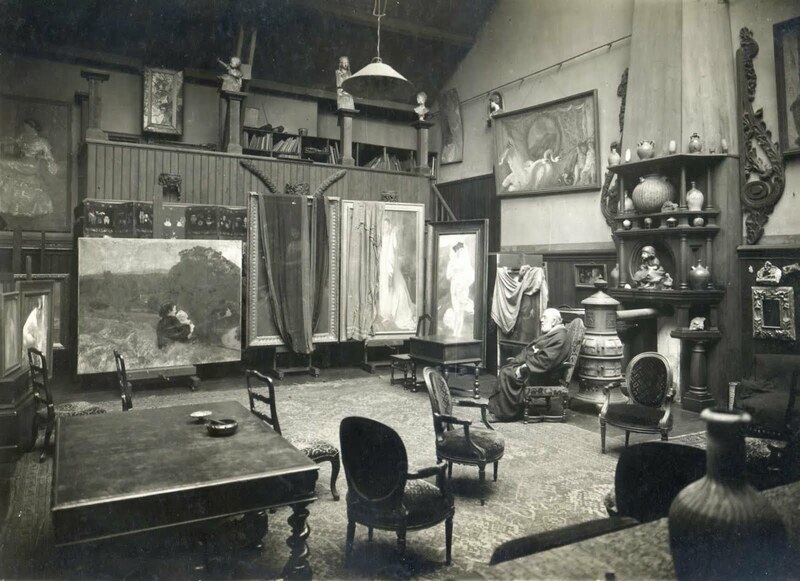 Undated photo of Albert, in his later years, in the Besnards’ Paris studio. Note the fireplace designed by Charlotte, which includes a portrait she made of their young daughter Germaine on the mantel. Our birthday boy’s life was cut tragically short when he was killed in the early days of World War I, at age 33. Before his death, he had led a successful painting career and married the American artist Lita Besnard, with whom he had three children. A casualty of the brutal trench warfare in northern France, he was one of an estimated 800,000 Europeans who died in the battles called the “Race to the Sea,” when German and Franco-British forces fought to outmaneuver each other all the way to the North Sea. For a year, the family held out hope that Robert may have been captured by the Germans and was a prisoner of war. 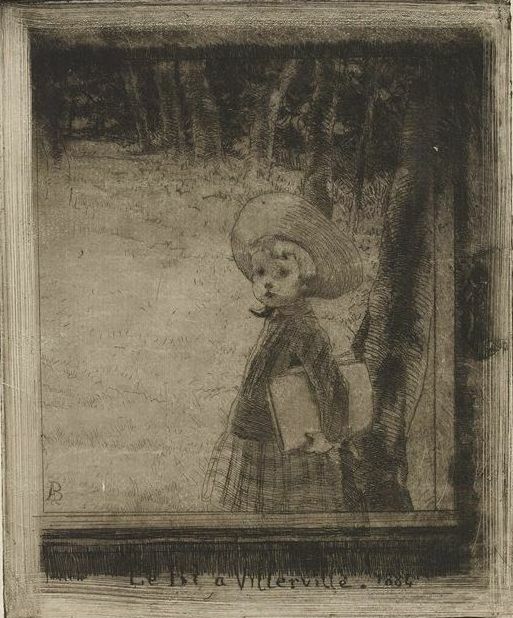 The earliest portrait of Robert, dated 1884, shows a toddler, age 3, carrying a folder of papers in a park. People describing this print often mistake him for a girl because he wears a dress, though this was common attire for boys in this period until around the age of 3 (and completion of toilet training). Robert’s short haircut and bangs firmly identify him as a boy. His plump cheeks—his defining characteristic—are gravity-defying as only a toddler’s can be. The inscription includes his nickname, “Le Bi,”(or “Little B”), and locates the setting as Villerville, a coastal village in Normandy, where the family spent much of the summer of 1884. Robert’s younger sister Germaine (1884–1975) was born there on July 17 of that year. Robert, now 4 or 5 years old, sips hot chocolate while his mother nurses his baby brother, Philippe (1885–1971). It is a scene of domestic bliss, with two chubby children relaxing on their mother’s bed, warmed by drink, as a baby nurse or chambermaid looks on. The comforts afforded by the Besnards’ professional success are on full display, including household staff and a well-adorned bedroom. This bust of Robert in profile at age 5 is dated by his father in the upper corner: August 31 (31 Ao [ut]), 1886. The boy appears close to this age in Sargent’s painting. We see the same contented stare and round face, although a trace of maturity might be glimpsed here in the boy’s slightly slimmer cheeks. 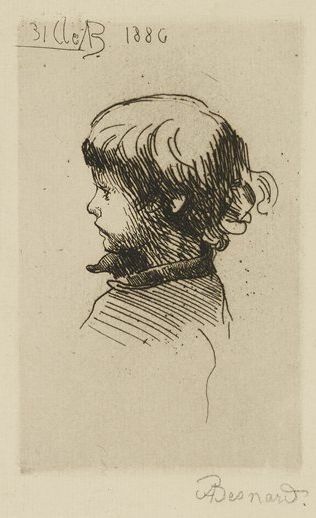 In this ravishing print—a sensitive portrayal of both the boy and the beast—Robert, age 7, appears decidedly older and wiser than Sargent’s birthday boy. He has the same Little Lord Fauntleroy haircut but his features are sharpening—his chin is more pointed and his eyebrows, which were barely visible, even infantile in the painting, are more prominent. Given his look here, it’s hard to imagine the painting being executed in 1887, just a year before this print. 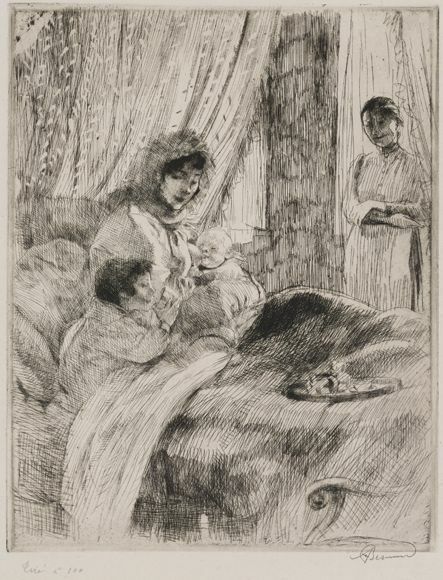 In 1890, Besnard executed two family portraits, this etching and a painting (pictured above), both titled A Family. The print shows Charlotte in the foreground with Germaine, age 6, Robert, age 9, and Philippe, age 4. 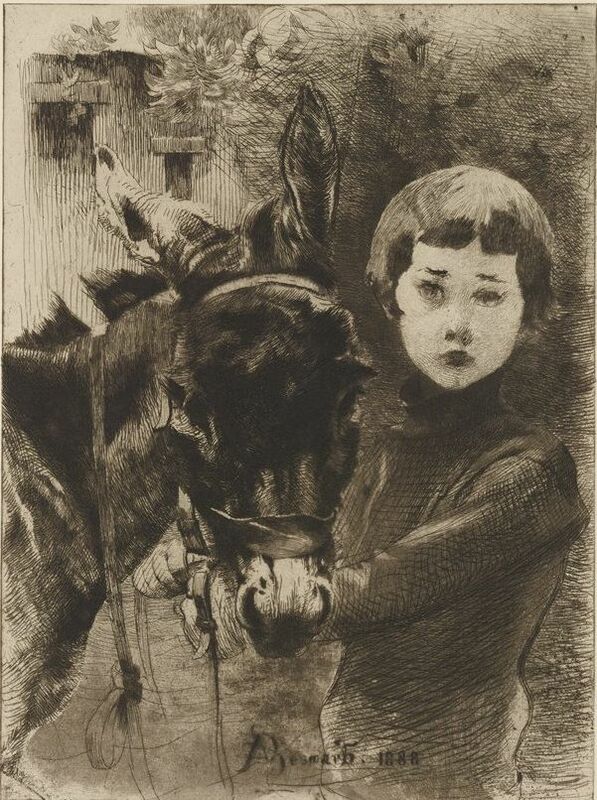 Baby Jean (1889–1958), born a year before this print was published, is included in the painting but not here. Robert is becoming a slender young man. He looks out at the spectator with a knowing, even slightly self-conscious expression. 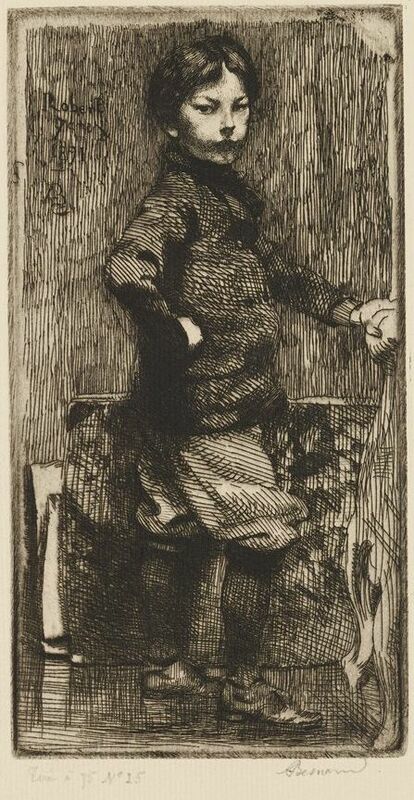 By this 1891 etching we see a confident boy of 9 and a half. While he’s not very tall, Robert’s facial features and attitude have visibly matured. Near his legs, leaning against the wall, is a large portfolio of drawings and prints. Such bins were a common sight in the large studio his parents shared in their Paris home, and it made an impression: all of the Besnard children became artists.